Find out more about the making of one of this season’s most talked about commercials, The Bear & The Hare. 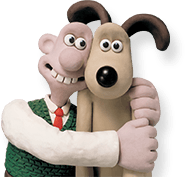 Back in the Spring we teamed up with VisitEngland to give members of the public the chance to design a Gromit inspired by their home towns and regions. Find out more about this exciting project and browse the finished Gromits on our Facebook page. Bring Back Morph Campaign Smashes Target! Thanks to the phenomenal success of the Bring Back Morph campaign, the much-loved clay creation will be coming to a screen near you in 2014! 20 People in a Box Entries We Love! Can You Fit 20 People In A Box & Still Lift It – Competition Winners Announced! We had some great entries into October’s animation challenge. We’ve now chosen a winner – read on to see who we picked and to watch their interpretation of the ‘Fit 20 People Into a Box and Lift It’ challenge!